Virgin Coconut Oil 20 fl oz Dietary Supplement • Certified Organic • Cold-Pressed and Unrefined • 100% Pure Supplement Facts Serving Size: 1 Tbsp Servings Per Container: 39 Amount per Serving Calories 120 Calories from Fat 120 Total Fat 14 g Saturated Fat 12 g Trans Fat 0 g Polyunsaturated Fat 0.2 g Monounsaturated Fat 0.8 g Ingredient: Organic Virgin Coconut Oil Contains no sugar, salt, starch, yeast, wheat, gluten, corn, soy, milk, egg, shellfish or preservatives. SUGGESTED USAGE: Take one tablespoon 1-2 times daily with meals. This Organic Virgin Coconut Oil can also be used in salad dressings, sauces, or any type of cooking as a source of essential fatty acids. 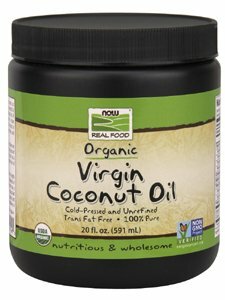 NOW® Organic Virgin Coconut Oil is a high grade, unrefined premium nutritional edible oil obtained from the first cold pressing of organic coconut (Cocos nucifera) kernels. Virgin Coconut Oil is naturally transfatty acid free and high in medium chain triglycerides (MCT). This oil typically contains the following beneficial fatty acids per serving (natural variation may occur): Lauric Acid 6.5 g, Myristic Acid 2.4 g, Caprylic Acid 1.0 g, Capric Acid 800 mg, Oleic Acid 800 mg and Linoleic Acid 200 mg Storage Guidance: Store in a cool, dry and dark environment in a tightly sealed original container. After opening, product can be refrigerated or stored at cool room temperature. This product may begin to solidify at temperatures below 78°F (26°C). Vegetarian/Vegan Product. Store in a cool, dry place. Keep out of reach of children. *These statements have not been evaluated by the FDA. This product is not intended to diagnose, treat, cure or prevent any disease.